The bank prime loan rate continues to hold steady at 3.25 percent. A significant rate reduction in one of the credit card offers tracked by this survey caused the average rate for consumer rewards credit cards to drop by 27 basis points to 17.64 percent, and the average for the overall consumer credit card category to drop by 19 basis points, to 16.99 percent. How much lingering damage was done by the shutdown? The temporary shutdown of certain parts of the Federal government took some money out of the economy directly as a result of the lost wages of furloughed workers. Then there was the ripple effect on businesses who depend on the government or its services for their livelihood. Finally, there was the fear factor, as many consumers and businesses were reluctant to spend money with a potential economic crisis hanging over their heads. As economic data for October and the fourth quarter start to become available, it will be more apparent how much damage was done. How big a shadow will the fresh set of deadlines cast over the economy? The arrangement to re-open the government and extend the debt ceiling was just a temporary delay rather than a long-term solution. A new set of deadlines looms shortly after New Year's. This could again cast a pall over the spending plans of consumers and business alike, and further erode Uncle Sam's credit standing in the global investment community. Against this backdrop, the holiday shopping season will be an important indicator of whether consumer have moved on following the budget crisis, or whether the general atmosphere of uncertainty has caused them to spend more cautiously. Naturally, credit card companies would welcome a healthier consumer, because if the economy weakens it could raise credit concerns. Those concerns could restrict the availability of credit, and make credit more expensive for consumers with weaker credit histories. The drop in consumer rewards credit card rates brought them to their lowest average since last March, and the average for consumer credit cards overall to its lowest rate since last April. In the process, because rates on consumer rewards credit cards fell while those on non-rewards credit cards held steady, the spread between the two averages fell by 27 basis points to 2.16 percent. That is the lowest this spread has been since February, making rewards programs less expensive now than they have been most of the year. For the third consecutive semi-monthly survey, there was no change in student credit card rates. 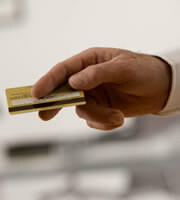 None of the credit card offers for either business rewards or non-rewards credit cards changed in this survey. The change in credit card rates not only lowered the overall average for consumer credit card rates, but it also reduced the spread between the rates for customers with the best credit histories and those with average credit. This is something of a best-of-both-worlds scenario -- often the weakening economic conditions that lead to lower interest rates also tend to heighten credit concerns. It remains to be seen whether this recent development can be sustained, but in the meantime it represents a good opportunity for consumers. 0 Responses to "Rates on consumer rewards credit cards get cheaper"